I am trying to find ways to continue to teach my kids the Word of God and how important it is in their lives. I want them to know it and apply it to their own life. They are teens so they get it, but sometimes it’s just good to get a visual on seeing your own name in scripture and KNOW that God is speaking directly too them and about them. Thinking about it in a more personal practical way. 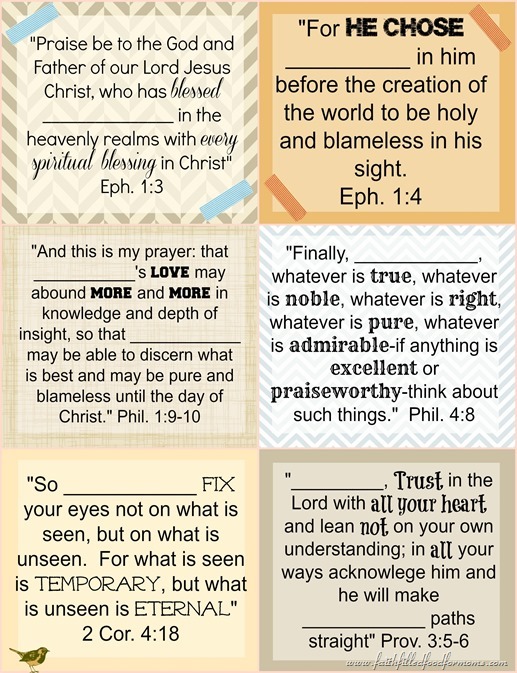 So I created these Printable Bible Verse Cards to personalize. Just right click, save and print you own scriptures to insert your own name into! So this is my disclosure for this little project: I am in NO WAY trying to change the God Breathe Inspired Word of God… I am simply trying to personalize His Word so that my kids can apply it to their lives…oh I already said that. These cards are for a little bit older kids…BUT I am having so much fun creating Encouraging Lunch Box Notes for Kids, Lunch Box Love Notes and now these..that I will definitely be making more! I hope you enjoy them and use them for your own kids. If you have a request I would love to here it and see what I can come up with! Hi Leah! I love that idea and I LOVE Psalm 139. I will do it! 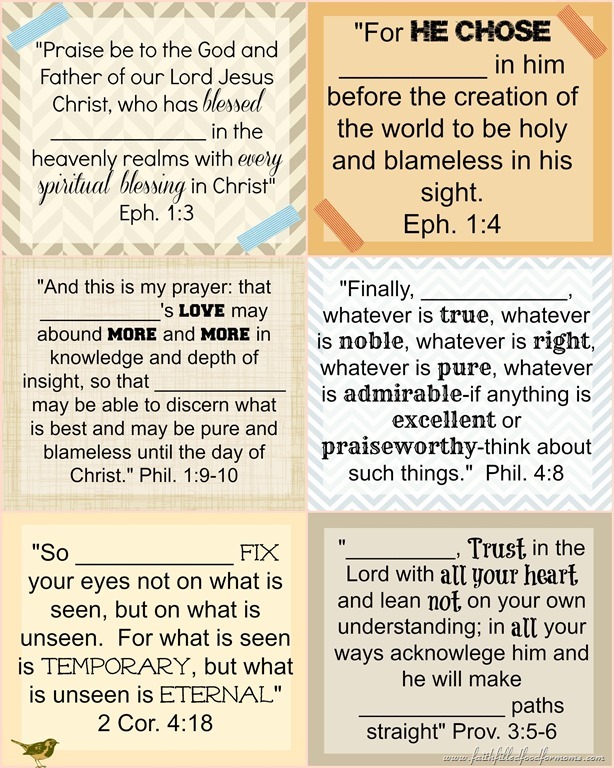 I’ve had such a favorable response to this printable that I will make more and that portion of Scripture is perfect! Thank you so much for stopping by! Blessings! This is such a great idea. I wish my printer was working! Our mother used to do this for us on recipe cards. Love this though, so creative! Great blog post. Thank you for sharing. We are from the link up at Deep Roots at Home. Nice to meet you. Would love to have you over to our place at https://rosevinecottagegirls.blogspot.com and thelifeofanotsonormalamericanteenager.blogspot.com sometime. My sister and I blog there together. Hello Girls! Thank you so much for stopping by! Too bad about your printer..but isn’t it great that we can still put our names in Scripture anyway..even without the printer! LOL I’ll hop on over tomorrow morning! I love how you made these to be personalized. I do that often when reading Scripture or writing in my journal. I have a set of cards ready to go up tomorrow but they don’t have this option. Don’t you love how God’s Word speaks directly to our hearts? Even after reading it for 50 years it still speaks and stirs my heart. Awww I love that Pamela…It still stirs mine after 30 too! God’s Word is definitely living!! Thank you for stopping by. I will be making more of these cards since I have gotten such a favorable response..so if you have some faves that you would like me to make..just let me know! Blessings to you! I love personalizing God’s Word by putting my name in it. Helps me to see that God is speaking to me. That’s awesome Jenifer! I will be making more..as I have gotten quite a great response to this printable. Thank you so much for stopping by and I’m happy to have found your blog and link up! Blessings to you! I like your idea and pinning them. I’m visiting you from Encourage One Another. Have a great week! Hi Ann! Thank you so much for Pinning and for stopping by! You have a great week too! Blessings! Great idea! Thanks for sharing your creative and hard work. I think it’s a great idea to insert our names into scripture. A good idea for kids to get into practice believing that God’s word is practical and for them. I agree Alyssa! I will be making more for different age levels too! It was so fun to make them! I insert my name as I’m doing them! Thank you for stopping by and blessings to you! I LOVE these! Thank you so much for sharing. What a great way for kiddos to personalize and internalize God’s Word in their hearts. God bless. I’m so glad that you enjoyed this printable. I will be doing more for different age groups since they have been so well received! Let me know if you have an age level request! Hi Ali! I apologize that I did not see your comment! You are so welcome and isn’t it so wonderful how God’s living Word is so life changing..everyday! Thanks so much for stopping by! Blessings! what a treat, this is wonderful. I am going to print these out and put them on the fridge and in my bathroom. Sitssharefest. Beautiful cards. Personalising Scripture can be really powerful! Awww thank you so much Momma Jo! What an honor! I will hop over in the morning and pray many will be blessed! 😀 I will be making many more downloads as I have had an overwhelming response to them! Stay tuned! Blessings! Just lovely! I really like how they can be personalized. Thank you so much for sharing! Featuring on this week’s Hearts for Home blog hop.